I started off the day with a game of Summoner Wars against one of my roommates. I had not played it before, but it was simple enough to pick up. This game, like so many that I tried this weekend, also used dice to resolve combat. It was fine for what it is. Mercifully, it uses a slippery slope mechanic where killing your opponent's creatures rewards you with resources to summon more and better creatures to your side. This would help prevent the game from dragging on indefinitely. It also incentivizes you to use fewer, larger creatures as your opponent taking out one of those gives only one resource to him or her, as opposed to multiple resources for killing several smaller creatures of yours. My opponent tried to retreat at one point, but forgot about one of my creature's ability that allowed him to zip across the board and deliver the coup de grace. Heading over to the exhibit hall, I saw that Geoff Englestein was over at the Z-Man booth giving demos of The Ares Project. I watched the tail end of one and then sat down myself for the next. You can read about that here. Afterwards, I wandered by the AEG booth. 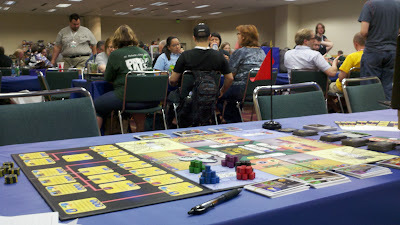 They had a visualy striking ninja-themed game, but all of those tables were filled up, so a sat down for Infinite City. This is my post on that. I had almost gone to a seminar of the philosophy of designing games, but the timing didn't work out. However, I did manage to attend a seminar on how to write a rulebook given by Mike Gray of Hasbro. My notes from that seminar can be found here. I had gotten a few people interested in playtesting Titans of Industry sometime Saturday night, so I went back to my hotel room to grab my prototype and relax for an hour so I would be able to analyze the playtest with a fresh mind. Seth Jaffee, with whom I have been working on Titans of Industry for a few months now, had said he wanted to see the playtest, so I wanted things to go smoothly. Quite predictably, when I went to round up my four scheduled playtesters, three of them dropped out to play in another event. I called around to people I knew at the convention to see if anyone would like to take their place. Of course, you can't expect people to be available at the last second during a convention. Lacking any other option, I headed to the Board Game Library hoping to snag random people looking for a game to play. Once in, I set up Titans of Industry and raised the red flag to indicate I was looking for players and hoped the prototype looked interesting enough to draw people over. In my next post, I will wrap up Saturday's events.